I am an aspiring writer, wife, and mother. My Precious Training Service Doge & I travel with my husband on his journeys through his career. I’ve written several unaccredited women’s lifestyle and educational articles and practice blogging. I have a degree in Art Education, Social Studies Minor along with LeadTech experience which gives me a wide range of topics to explore & write about. Father, as writers, we investigate and imagine, pushing back boundaries and looking for new connections. We throw ourselves into new worlds and create new characters. You have broadened our understanding. Thank you for imagination’s dew. I have always used the Planner/Notebook system for my home organization. That was usually jotting some things down in a calendar that got lost and shuffled from purse to purse and a notebook full of grocery lists, story ideas, and incomplete things I intended to do, and usually forgot. Organization and planning are better for me under the direction of my husband who uses calendars for goals, and lists. Managing our life has evolved my Planner/Notebook system into something workable as long as I am a stay-at-home-wife, and nothing more. The notebooks are used for daily calls, paperwork, and things to do; lists my husband and I compile together. Agendas are for keeping financial and household documents current. Managing our household is full-time work activity in itself. Adding new work and more goals have put my old system to the test these past few years and I find myself seeking direction for time management again. New writing opportunities come with “get organized” fever. An old binder for a rival Time Management company engaged an online search for printable fillers or a filler specific to my needs that I can purchase. Instead, I found Quo Vadis, the Quo Vadis Blog, and Plannerisms Blog. Ms. Doherty stated in the post that she was planning some updating on the Quo Vadis sites and needed product reviews. She asked that anyone who has written a product review in their blog or website, email questions and the link to their page or blog site for an opportunity to write a review. Writers would receive credit for their review that links directly to the reviewer’s blog from the Quo Vadis web site. 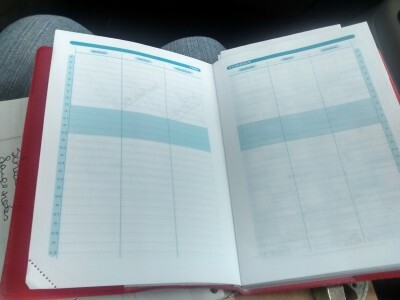 Although I am reviewing two planners, I only purchased the Text Agenda. I received the Scholar planner for free in exchange for writing this review. Emails submitting my resume and writing sample for freelance work. A Short Story Submissions & Writing Schedules. I have never accomplished organization at this level before. 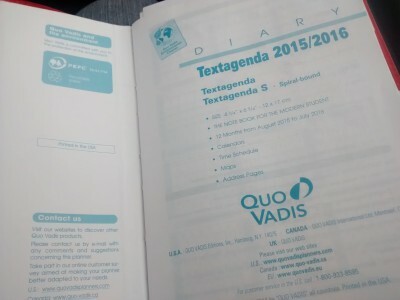 Text Agenda opens like a diary, devoting a whole page to each day of the year. Each page is ruled for neat recording of notes, lists, and details of daily activities. 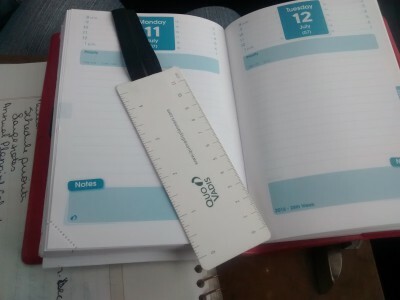 The Agenda opens to a facing title page, and personal information page. A July, 2015 –June 2016 yearly planner faces the personal info page. Two Full weeks of Time Schedule Planner pages follow. The 2015-2016 Anno-Planning pages give a complete view of the year’s plan. Buying a calendar in August usually leaves a few blank calendar days at the beginning to allow for transition from one Academic year to the next. I write notes and information needed throughout the rest of the year, and may not fit under any given agenda topic, ie. Frequent websites and passwords. Text Agenda is an awesome planning tool for anyone from Student, to Home maker, including Business people. It is ideal for people who live for daily activities without needing a schedule organized for planned activities that occur on a weekly basis. 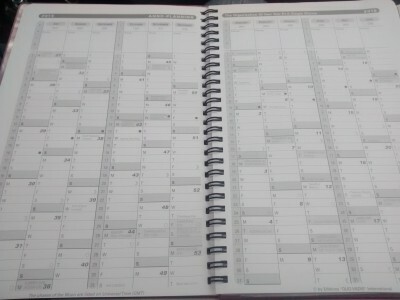 Any woman who is managing her household should consider purchasing this Calendar, Journal, and Scheduling tool. Adding a second job to Home Management created the need for a second schedule. Women who work outside the home or participate in activities that require following a schedule through several days or weeks need the extra organization a weekly agenda would supply. 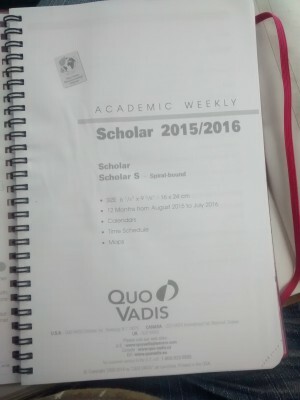 Scholar opens to a facing title page, personal information page. Followed by an 8 AM-9 PM Time Schedule Planner for the week. The 2015-2016 Anno-Planning pages give a complete view of the year ahead. 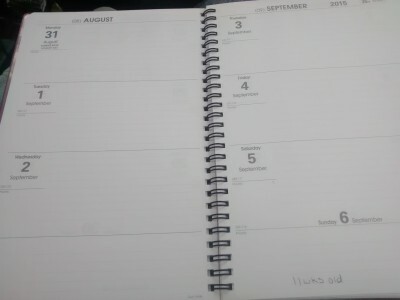 Weeks open in 2 page, viewing the full week from left to right that shows Monday as the first day of the week. Room for extra notes are at the bottom of the left side page. Scholar feels like exactly the time management tool I need for organization of time AND information. With this agenda I have moved my blog from struggling for days to research, write, and publish my message to a weekly schedule of daily posts on specific topics. Writing those posts is easier with scheduling that leads from general topics to precise outlines that vary according to the subject matter of each post. 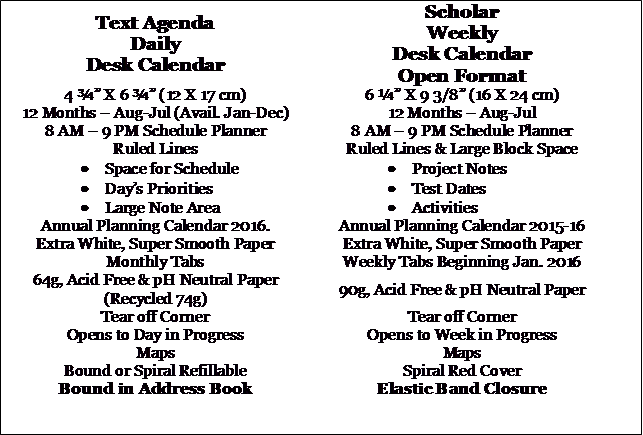 A side by side comparison shows two agendas, each more than suitable for its purpose, but when combined, they create a dynamic organizing and time management system that keeps even me on track.The Bound in Address Book found in Text Agenda should be added to the scholar and the Elastic Band Closure found on the Scholar Agenda should be added to Text Agenda. Together, these planners are unbeatable time management tools. Cj Sanders I am an aspiring writer, wife, and mother. My Precious Training Service Doge & I travel with my husband on his journeys through his career. I’ve written several unaccredited women’s lifestyle and educational articles and practice blogging. I have a degree in Art Education, Social Studies Minor along with LeadTech experience which gives me a wide range of topics to explore & write about.